Imagine taking 10 gallons of white and pink blossoms, and forcefully shoving them onto a branch capable of holding at most half that amount, and that's the feeling you currently get from two trees in my neighborhood. I don't know what kind of trees these are. 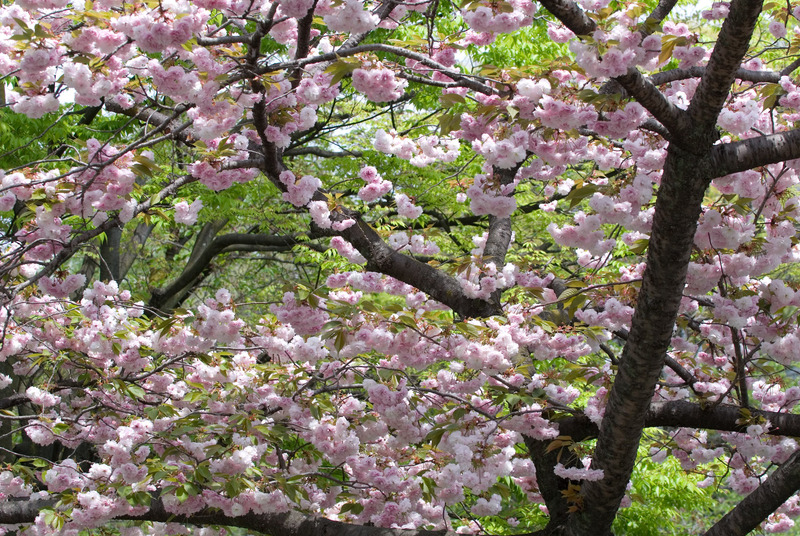 If they are cherry trees, they're blooming long after all the other cherry trees in this neighborhood. 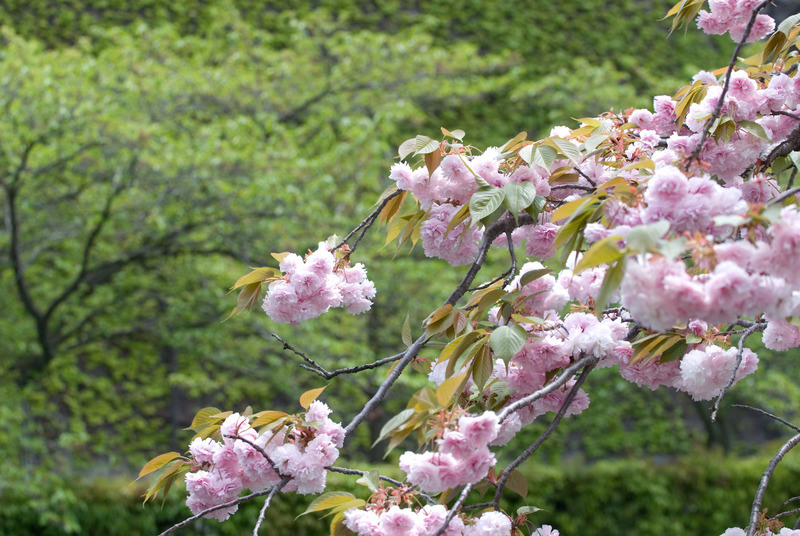 Update: thanks to Aaron and Andy for identifying them as “yaezakura” or “botanzakura” cherry blossoms. 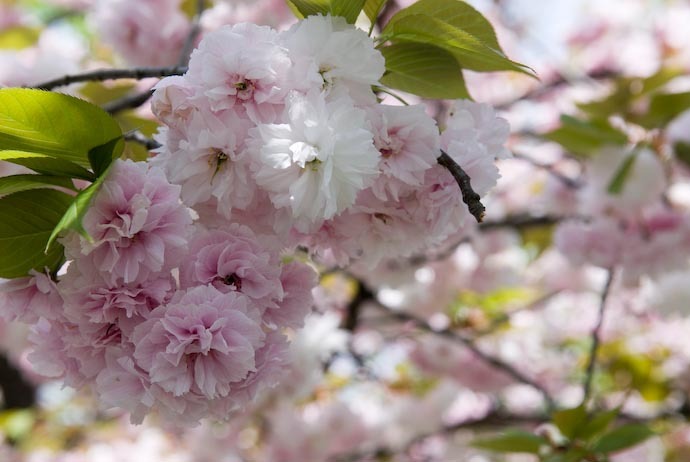 These blossoms range from almost pure white to a mildly deep, rich pink, often the whole range being found on a single branch. 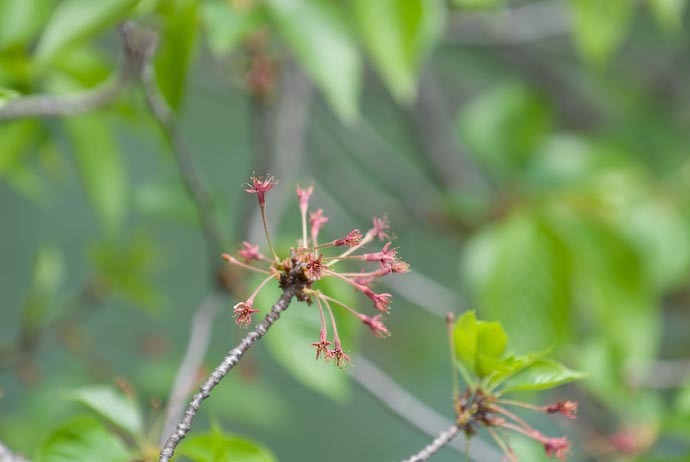 Yet, they seem to congregate in cliquish bundles of like-minded blossoms, with one pom-pom's worth mostly one shade, and the neighboring one another. Perhaps they were high-school girls in a former life? White? Pink? Why not Both! 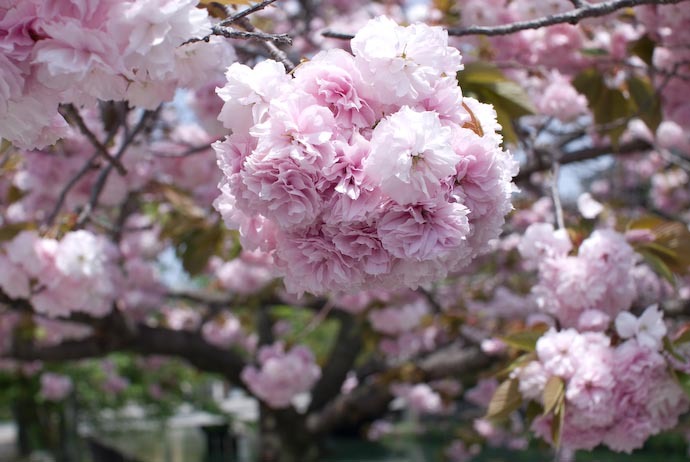 From afar, the trees look to be adorned with enormous, discrete puffs of pinkish cotton or pom-poms, as if these trees were populated by gaggles of 9-year-old girls fresh from the mall, invisible except for their hair decorations. 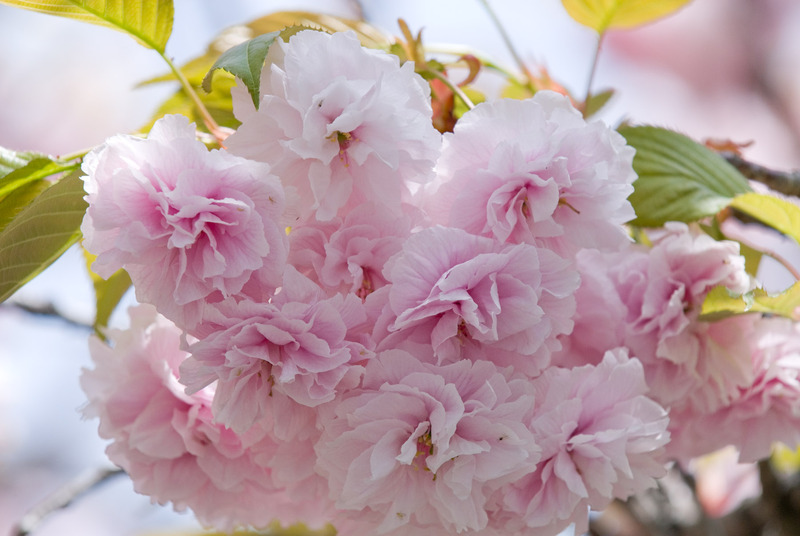 The individual blossoms are huge... perhaps two inches across (substantially larger, deeper, and more full than common cherry blossoms). 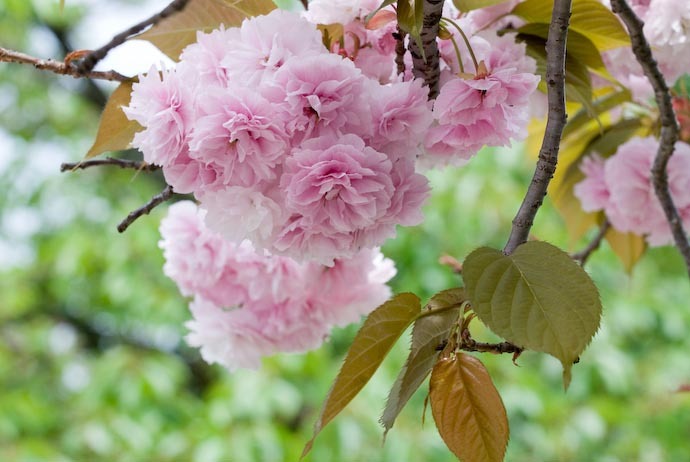 Huge quantities of these two-inch blossoms are then grouped tightly to form pom-pom-like clusters. Close up, they appear quite fake, as if an overly crafty Martha-Stewart-type made them from vast quantities of the most pretty, delicate crepe paper. The pom-poms seem to be more tightly bunched (if that's at all possible) on the second tree compared to the first. There's a definite difference in overall look and feel between the two, as can perhaps be seen when comparing the first two pictures on this post. I tried some pseudo-macro work by interposing a Kenko 12mm extension tube between my D200 and my Sigma 30mm f/1.4. The resulting magnification doesn't quite reach the 1:1 ratio required to be called “macro,” but the blossoms fill the frame well enough. I don't have any experience with macro photography, except when I put a bunch of extension tubes on my Nikkor 70-200/2.8 the other day (see the last two pictures on this blossoms and buds post). 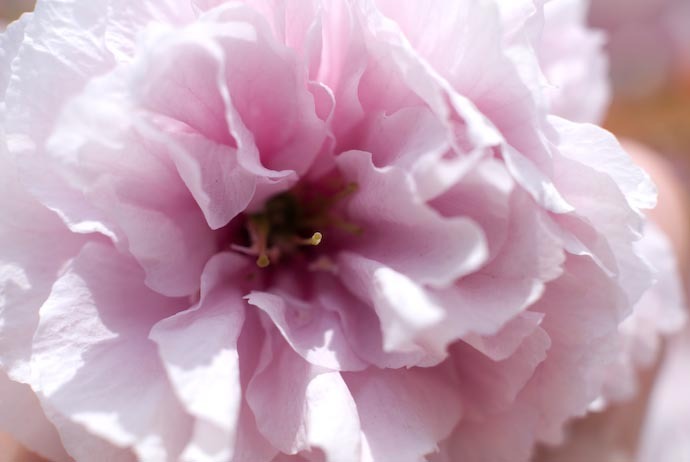 The picture above was taken while I was straining to be three inches taller, on my tiptoes, holding the blossom steady with one hand, the camera in the other, and focusing by adjusting my distance from the blossom. Rube Goldberg would have been proud. The result is not too bad for such a cheap solution. It had some pretty severe chromatic aberration in the upper-left corner, but that was tamed to a good extent in Adobe Lightroom by slapping both chromatic-aberration sliders to their max. Me: Wow, Anthony, look at those flowers. Aren't they beautiful!? Anthony: I know you want to take a picture of it. You do. Ah, he knows me well. More blossom posts here. I think those are called ‘botanzakura’….not totally sure. I enjoy seeing all the wonderful photos you publish here – keep it up! Cheers … and, indeed, keep publishing the great photos! I like An Edge of Tree #2. Stands out. I could almost feel the enviroment by looking at it. Rest of them are just Spring. But that one I like, really. Great pics! I have always wanted to travel to Japan, your culture is one to be proud of. I love your pics, especialy the momoji…..it’s so wonderful..
There’s no momiji in my place and of course there’s no autumn too coz i live in Indonesia which is the tropical country. I moved into a house and this beautiful pink flowering bush flowered and now it looks like it’s dying. What should I do it’s such a beautiful flower.